The FX Network releases a new teaser and poster for its upcoming horror drama The Strain; Legendary Television announces development of an Extinction Parade adaptation from writer Max Brooks (World War Z); The Killing gets a premiere date for its final season from Netflix; and HBO pushes The Leftovers premiere back two weeks. After effectively creeping out viewers with early teasers from its upcoming vampire series The Strain, FX delivered more skin-crawling imagery to promote Guillermo del Toro's latest project this week with a new teaser trailer and poster (both below). Previous glimpses of the show have made it clear that The Strain will feature much more disgusting, grotesque and less romanticized vampire creatures than The Vampire Diaries and True Blood have brought viewers, but this latest tease also introduces a psychological horror component, as a mysterious someone (or something) drops handfuls of candy down into the street - presumably as bait. Based on an original book trilogy co-written by del Toro and Chuck Hogan, The Strain tells the story of a viral outbreak in New York City that turns human hosts into parasitic bloodsuckers, and the small band of survivors who attempt to prevent the plague from spreading. For more details on the series, check out the show's official synopsis below, as well as a new poster. "'The Strain' is a high concept thriller that tells the story of Dr. Ephraim Goodweather (Corey Stoll), the head of the Center for Disease Control Canary Team in New York City. He and his team are called upon to investigate a mysterious viral outbreak with hallmarks of an ancient and evil strain of vampirism. As the strain spreads, Eph, his team, and an assembly of everyday New Yorkers, wage war for the fate of humanity itself." Along with Stoll (House of Cards), the series also stars Mia Maestro (Alias), Sean Astin (The Lord of the Rings trilogy), Kevin Durand (Fruitvale Station), Natalie Brown (Being Human), Jonathan Hyde (Titanic), Richard Sammel (Inglorious Basterds), Robert Maillet (Sherlock Holmes), and Miguel Gomez (Louie). John Hurt was originally cast as Professor Abraham Setrakian, but his role is currently being recast. 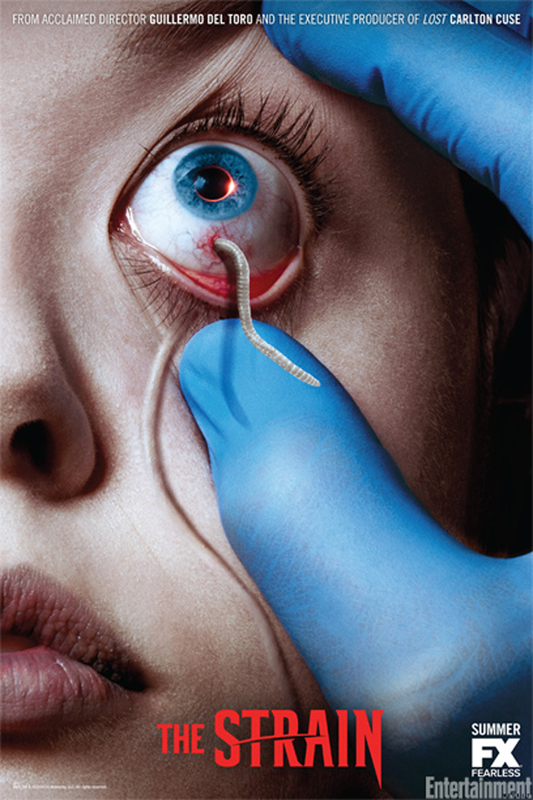 Stay tuned for a full trailer and additional info on The Strain as the show nears its July 2014 premiere on FX. Speaking of vampire TV shows, Legendary Television decided to join in on the trend this week as it announced development on a adaptation of Max Brooks' Extinction Parade comic book series. The company not only optioned the property from Brooks, but also confirmed that the author - known for his novels World War Z and the The Zombie Survival Guide - would be closely involved with the project and in adapting his own work for TV. "I only brought the idea to one company, Legendary, because they do the kind of quality work of which any writer would be proud. While the comic series from Avatar continues, I am thrilled to be working with Legendary to develop 'Extinction Parade' into an innovative new series for television." Described by Avatar Press as a "stunningly rich tapestry of cultures in decline and a biting indictment of the perils of privilege," Extinction Parade tells the story of the decline of a decadent class of vampires as a zombie virus wipes out their human food source. The books focus on how each species attempts to evolve as they struggle to coexist with humanity stuck in the middle. There's no word on which network may be interested in picking up the pilot, but considering how hot both the zombie and vampire genres are in TV right now, a zombie versus vampire show should attract plenty of attention from some of the medium's major players. We'll pass along more information on Extinction Parade as it comes in. After being picked up for its fourth and final season by Netflix last fall, The Killing finally landed a premiere date for its last batch of episodes this week, and will debut on the streaming service on August 1, 2014. The show's first two seasons followed Detectives Linden (Mireille Enos) and Holder (Joel Kinnaman) investigating the murder of Rosie Larsen, while the third picked up with the characters a year later as they discovered a string of grisly murders connected to one of Linden's past cases. Information on the plot of the final season is scarce, but we do know it will involve a new murder case at an all boys military academy. Despite earning a healthy amount of critical praise during its three-season stint at AMC, the drama endured a rocky relationship with its parent network and was canceled twice before Netflix rescued the show for a six-episode run this year. Some may argue the small episode order isn't a proper sendoff for the series, but as unceremonious as it may seem, it is, at the very least, a sendoff. Look for The Killing season 4 when it hits Netflix on August 1, 2014. Earlier this month, HBO set The Leftovers for a June 15 premiere, but the network changed its mind this week and decided to push the show's anticipated debut back two weeks to June 29, 2014. With a talented ensemble cast - including Justin Theroux, Christopher Eccleston (Doctor Who), Liv Tyler (The Lord of the Rings) and Ann Dowd (Compliance) - and Peter Berg (Lone Survivor) directing the pilot, the Damon Lindelof-created adaptation seems to have plenty going for it. While such a delay could often signify some production problems behind the scenes, HBO described the show's brief two-week shut down as "a short hiatus to prep our final episodes." The network also added: "Our production schedule shifted and subsequently that necessitated a change in our debut date." The high-concept drama, which follows a group of people in a small town left behind after a Rapture-like event causes their friends and loved ones to disappear, should still benefit from the substantial amount of buzz it has received thus far leading into its premiere. However, ratings could take a slight hit from the rescheduling, as the series was originally set to directly follow the Game of Thrones season 4 finale on June 15. For those unfamiliar with the project, check out the show's latest teaser trailer. And for those, like us, who are intrigued, check out The Leftovers when it premieres on June 29, 2014 on HBO.